If you know Johnny Codd at all, you will not be surprised by this picture. 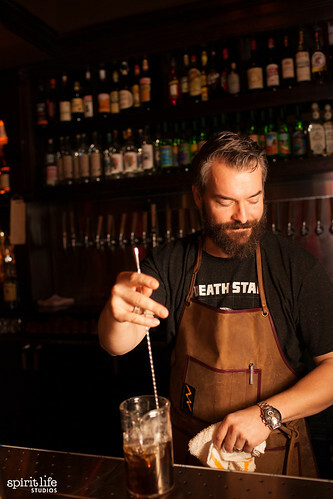 That's because Johnny has been known for this kind of flair in execution at bars across San Francisco — from Wo Hing to the Coachman to Gaspar. He's honed a graceful approach to cocktails. It comes through in novel presentations and in well-balanced, sometimes unlikely, flavor combinations. 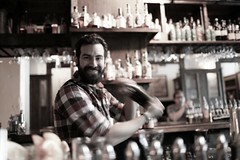 Johnny recently took over running the grandiose bar in the Tenderloin, Tradition. 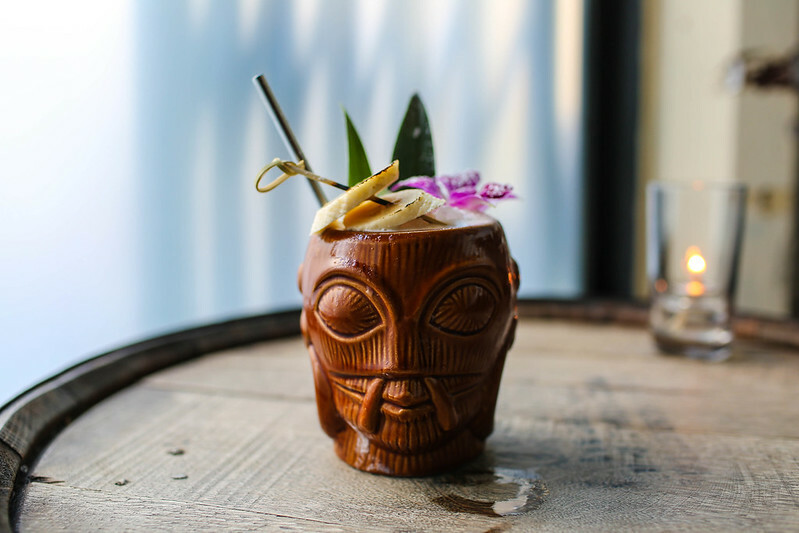 Tradition is a bar built on a concept that the name suggests: The menu pulls from all styles of making drinks — from dive bars to Prohibition, from tiki to British and Scottish. 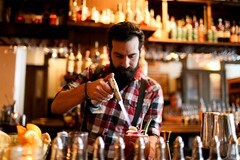 Such a wide variety of cocktails creates a ready stage for Johnny to play in what he does best: creative cocktail development. 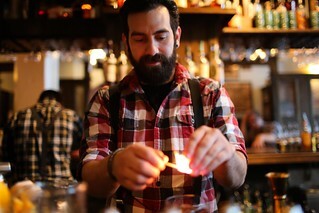 As with his previous bars, Johnny is driven by an ambition to wow visitors. 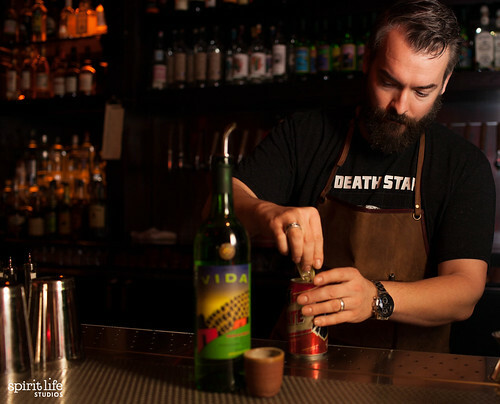 He always seems willing to go the extra mile to delight the most jaded bar flies with something new and cool in their drinks. Want to meet the cocktails on Tradition's new menu? 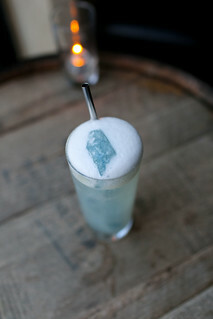 Molecular - Ford's Gin, clarified lemon, gomme syrup (sugar), soda water, blue ice, soda, and juniper foam. The blue ice isn't made of the stuff from the Easter Egg coloring kits when you were a kid. It's made from butterfly pea flower, an ingredient that is beginning to trend, both in the tea world and now up-and-coming in cocktails. It is a flavorless, organic leaf that turns from blue to purple as acid is added. This drink itself is "molecular" for additional reasons. Johnny uses his coveted industrial-strength centrifuge in back to clarify the lemon juice, a process that removes all impurities and makes the juice silky smooth. 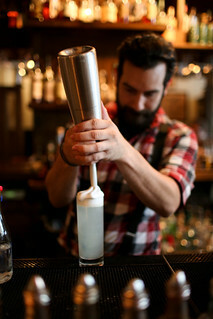 On top, he adds a juniper foam made using an ionizer juniper. 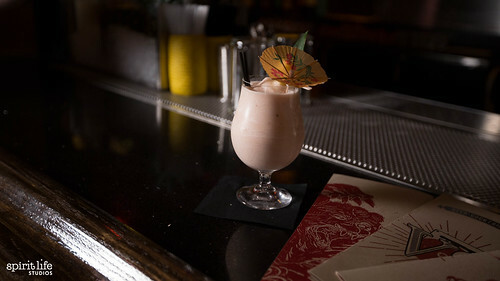 The result is a drink that is pleasantly clean, delicious, and slightly creamy. You could drink the same thing all night. The Big Easy - Rittenhouse Rye, rum, vermouth, Benedictine, and Trinity bitters. The ingredients list on the menu lets the star of the show surprise you: GOLD! Who doesn't love gold! Johnny garnishes the drink with a satisfyingly warm, glimmering gold cherry and shiny accent on the base of the coupe — all non-toxic. 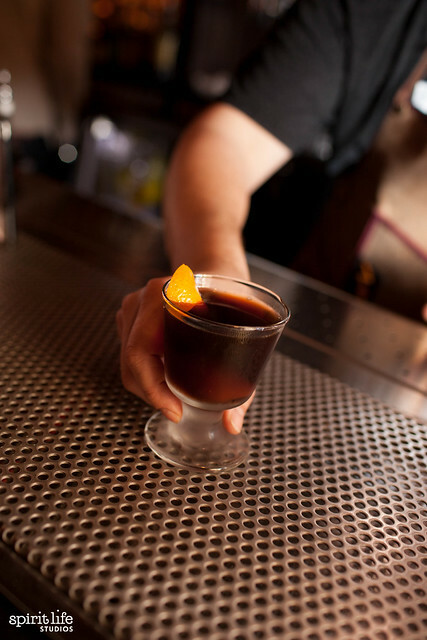 The drink itself is a twist on a classic: the Vieux Carre, which is one of Johnny's personal favorite cocktails. 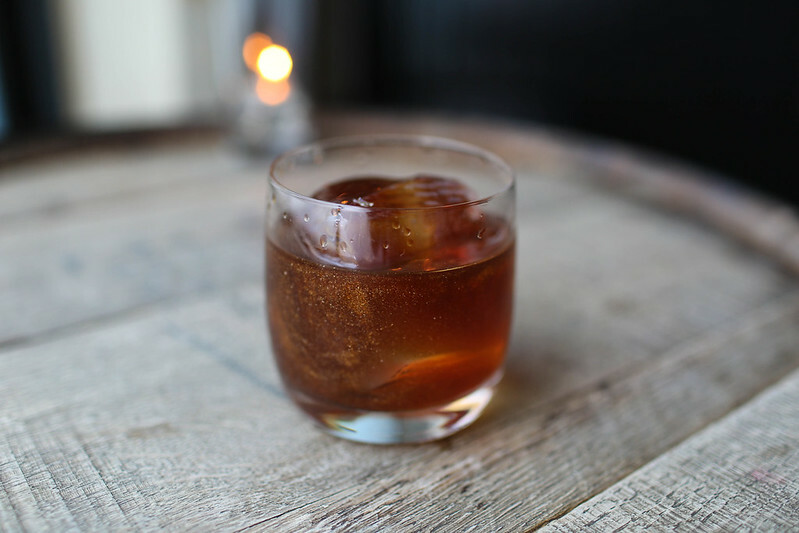 Instead of the classic cognac you'd find in a Vieux Carre, Johnny swaps in rum and adds Trinity bitters (which has hints of orange and cherry) instead of the traditional angostura and Peychauds. Between the gold and the warm, classic flavors, it's a drink that'll make you feel you you're wearing an evening gown or tux. The Parting Glass is a beloved drinking song sung at the end of the night in Scotland and Ireland. Johnny honors the tradition with a nice pour of Irish whiskey and spicy flavors that will warm you up as quick as apple pie. 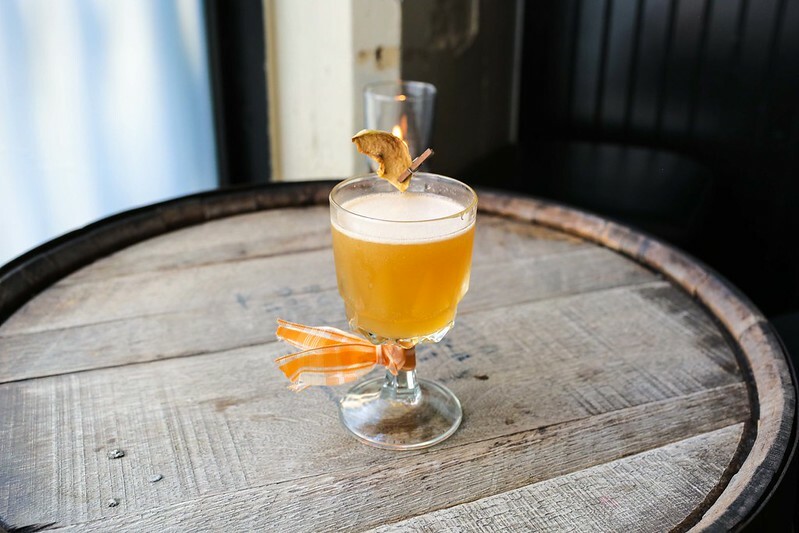 The drink is made from Bushmills Irish Whiskey, lemon, tree maple, baked apple, and ginger. Two words: sparkle dust. Yes, there is glitter in this cocktail. 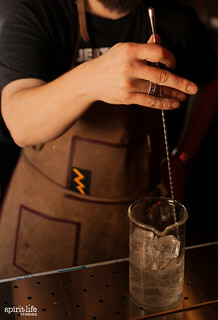 Using, again, non-toxic magic, Johnny adds some sparkle to an otherwise stiff and serious drink. Tip: The glitter is best seen when stirring up the cocktail, so be sure to give it several whirls — because you can. The rest of the cocktail is a deep and spicy mix that will make Old Fashioned fans happy. 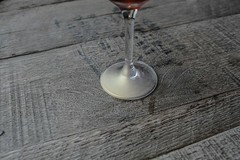 It is made from Monkey Shoulder Scotch, Tradition Amaro, smoked sherry, cinnamon, and silver dust. 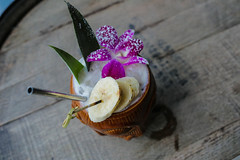 Johnny is known for trying to make the details of a cocktail fun, and in this case he does it by toasting the banana garnish in this drink until it is warm and crispy. 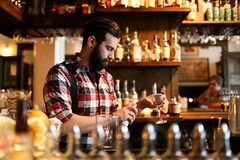 He also uses one of England's favorite tea, Yorkshire, and infuses it into gin. To that he adds, Bacardi 8 rum, coconut cream, and green pineapple — creating a creamy, but tropical, drink with a fragrant finish. Johnny's nod to the British pub is funky and easy to drink. 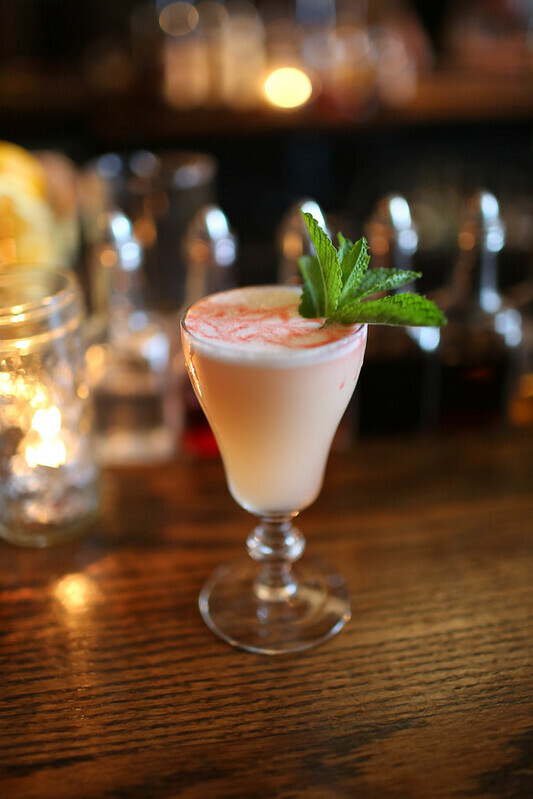 It uses Junipero gin — in the British tradition, of course — and adds to that house passion fruit syrup, lemon, rose, vanilla, and a bit of egg whites for froth. The drink may look pretty and fruity, but beyond the pink is a complex cocktail. It's made of Reyka vodka, lime, Creme de Noyaux (made from apricot pits), black pepper, and a pour of bubbly champagne. Every menu must have a vodka drink, and this one has plenty of depth from the lime and black pepper. 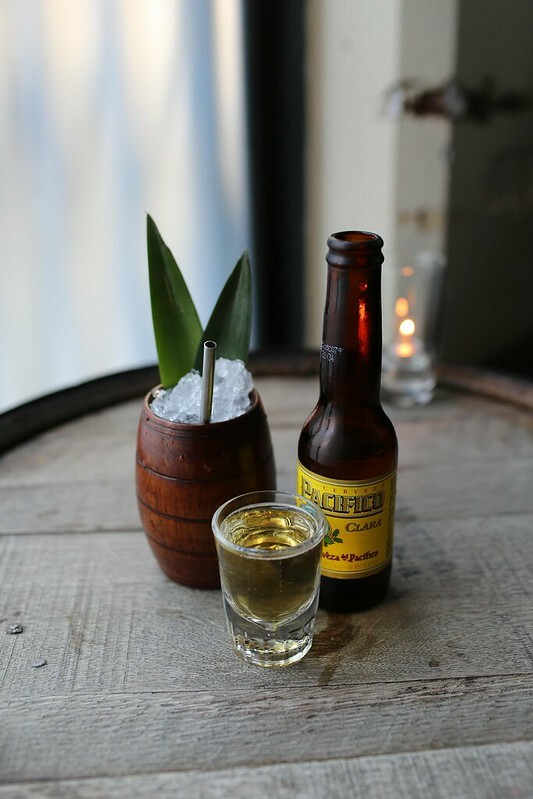 This is not the typical beer with a shot you'd order at a dive bar. 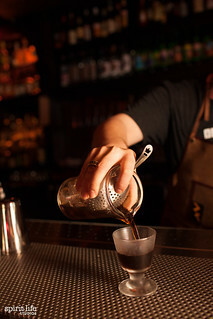 Johnny inverts it by offering a strong — but refreshing — cocktail with a shot of beer. 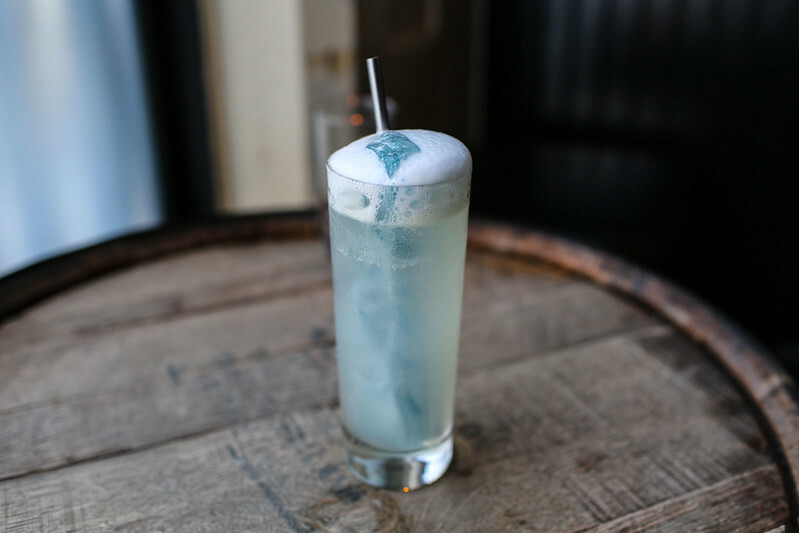 The cocktail uses some strong stuff — like El Silencio mezcal, Chartreuse, and white pepper — but then cools it down with funky ingredients like lime and pineapple sorbet. Dry Pacifico washes it all down. If you're anything like us, you'll be returning to this fun pairing in the future. 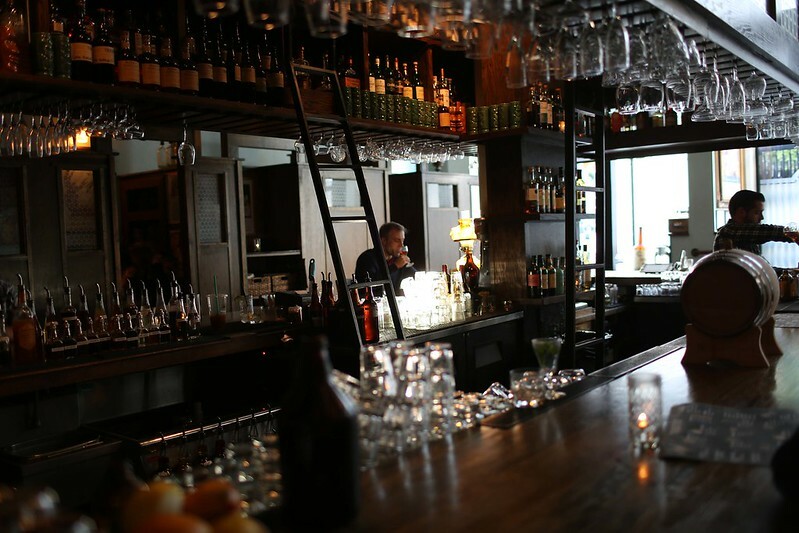 After a quiet summer, the end of 2015 was a big season for bars in San Francisco. Where is everyone now? 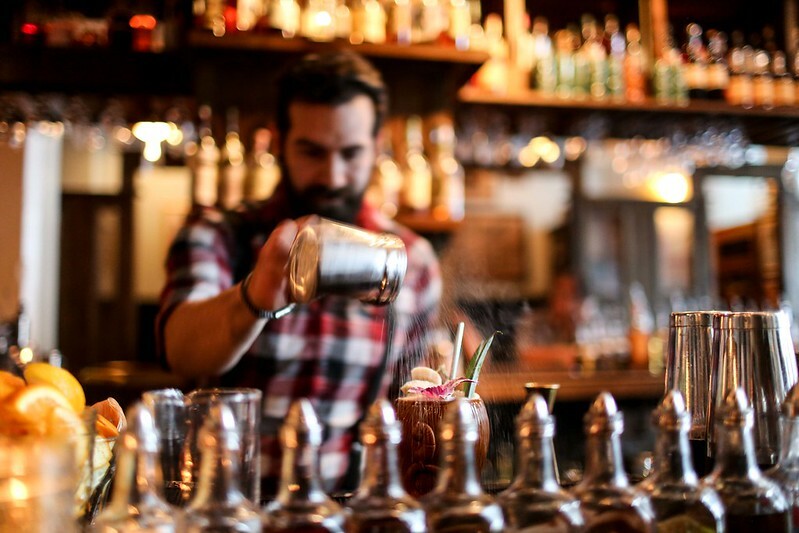 We often get emails about where regulars can find their favorite bartenders. So we decided to make it easier for everyone. 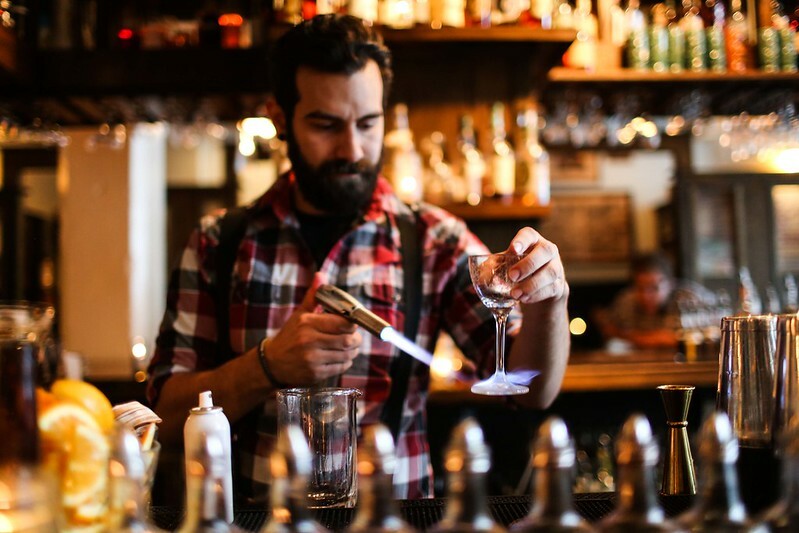 We're putting together a regular list of where some of the most talented people behind the bar have been coming and going in the past three months. Hear something or want to be included on the list? Drop us a line at hello@spiritlifestudios.com. We'll fact-check it and add it to the list. 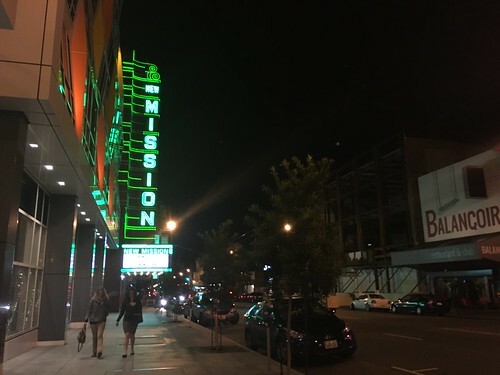 Isaac Shumway opened up the new Alamo Drafthouse in the Mission. They are doing kitchen-style service for the theaters and also running a dedicated bar space called Bear Vs Bull. Stacked on his roster are Christian Clark, Helen Diaz, Chad Henry, Rhachel Shaw, Andrew Mundy (back from Florida), Joel Baker, Will Popko, Michael Fleury, Ally Opstedal, John Fragola, and Dan Rubin. Claire Sprouse celebrated her last night at the Hideout as she continues her cross-country work with Tin Roof Drink. 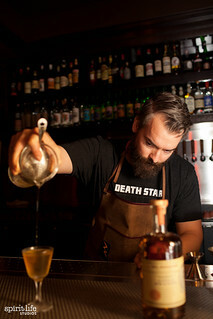 Johnny Codd is continuing to manage the formidable cocktail program at Gaspar but can also be found making appearances behind the wheel at Bourbon and Branch. 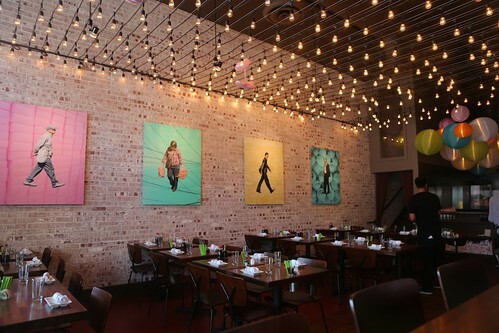 After leaving BDK, Kevin Diedrich opened up a new popup called Turnkey in the Cantina space. Joining him is longtime teammate Adrian Wong. Anthony Parks took over the program at Mourad and is on his second iteration of the menu based on the the winter season. 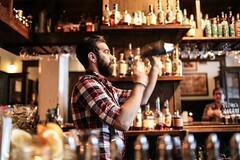 Zachary Brian Taylor left the program at Dirty Water and can now be found slinging on Saturdays at 83 Proof. 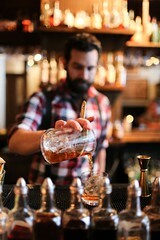 Randy Mariani helped open the new Oro in Soma and is leading the cocktail program there. The restaurant opened its doors in September. Keli Rivers is capitalizing on her passion for gin by helping Martin Cate and Alex Smith get going at Whitechapel which first opened its doors in October. 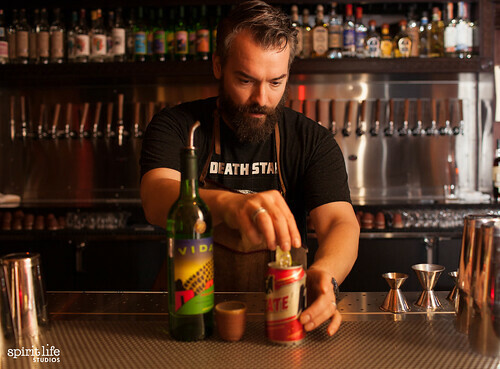 Dan Stahl joins the crack team over at ABV, which means that the "best new American Bar," according to the Spirited Awards, somehow got bestier. 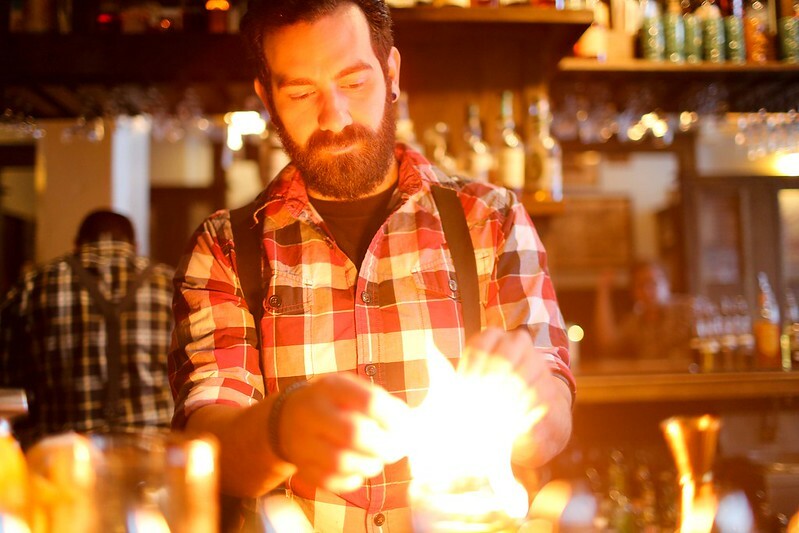 He's splitting his time between ABV and working with cocktail innovators Justin Lew and Ian Scalzo at Tsk/Tsk, which is blowing out New Year's Eve before closing down to build out cocktail lounge Horsefeather. Jay Villafana continues his work at the inventory software company Beverager. 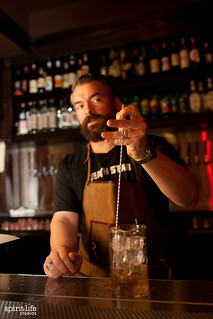 He's not at Raven anymore (the last party was Saturday), but you can find him churning out drinks at The Slanted Door. 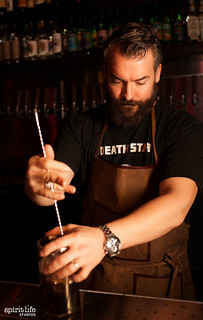 Jared Bene, formerly of Bar Agricole and Trou Normand, has taken over the cocktail program at Izakaya Rintaro. Christina Cabrera, formerly of Novela, has taken a new post leading the program over at Barbarossa, which opened in October. 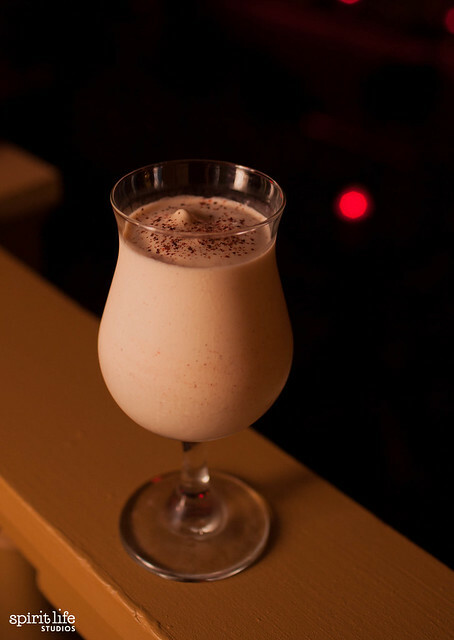 The abrupt closing of Chino in the Mission was one of the saddest this year, but you can still thankfully spot Danny Louie pouring out drinks over at Dalva on Mondays. After 20 years behind the stick, Brian MacGregor left Wingtip and embarks on new adventures working as a local field specialist for The Macallan Single Malt Whisky. Shared Brian, "The decision was not made lightly, but as my family has grown, I now have two beautiful little girls. I needed to have a job that allowed to be more present as a father and a husband." Sam Houston (formerly of Saison and Alexander's Steak House) and William Tsui have both left Jasper's in the Tenderloin and are at work on a new popup called Tiger and Crane. You can also find Will making appearances at Bon Marche and Dirty Water, while Sam has been sighted in LA. 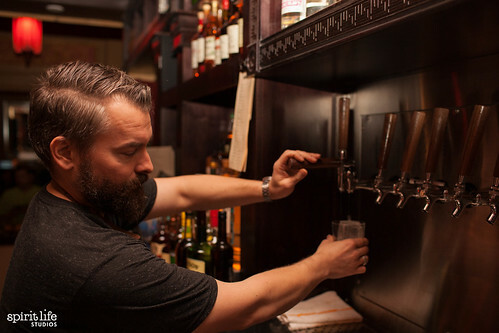 After shredding on the road with his band King Woman, Colin Gallagher is back behind the bar at Trou Normand and Hideout. Catch him before he goes on tour again. Our bad: A previous version of this article incorrectly stated that Neil Roche was over at Alamo Drafthouse/Bear Vs Bull. 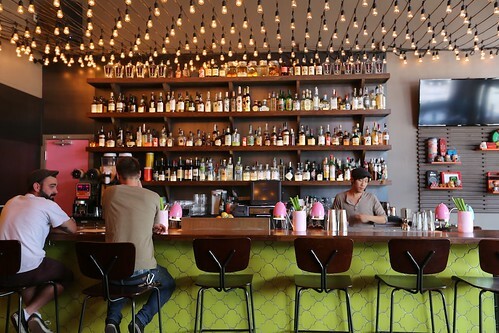 He's mixing things up over at Ramen Shop in Oakland with Chris Lane. Last Call: After a decorated run at Maven, Kate Bolton is off to Portland where she will be managing the bar at Americano—Blair Reynolds's sophomore bar highlighting coffee (Tim Hagney will be taking the post at Maven). SF also said farewell to Don Mallory who left Rich Table to move to the great city of Chicago. He's nabbed a corporate position over at Lettuce Entertain You, a big restaurant company in the Windy City. Kinson Lau, meanwhile, left San Francisco to go shake things up in Las Vegas. It is a truth universally acknowledged that in order to get a decent cocktail, you need to 1) recite a password to gain entry, 2) divine the meanings of a deeply poetic menu, 3) cower at a sassy bartender. 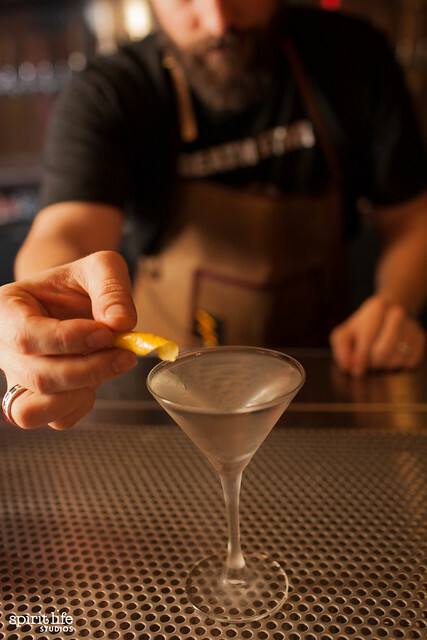 OK, so maybe we're being overly dramatic to make a point (pound sign handonforehead), but lucky for casual bar flies, more and more bars in San Francisco are on a trend to make cocktails less pretentious. 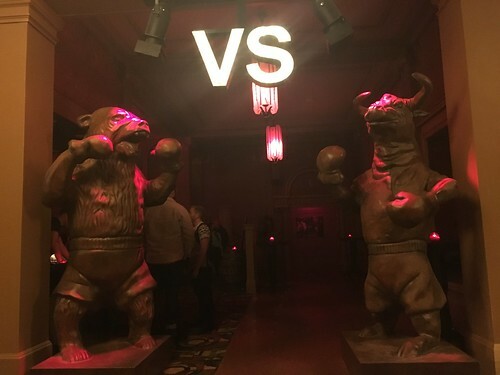 Bear Vs Bull, the bar inside the newly opened Alamo Drafthouse Cinema, is part of that movement. 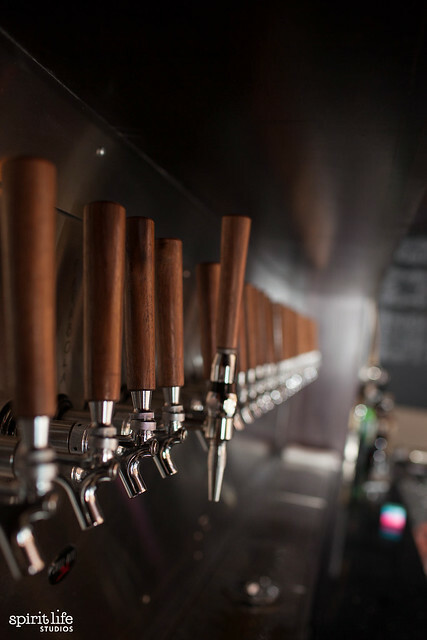 Drink nerds have been anxiously awaiting the project's opening for months now. The team that originally built a following at Tosca has reunited for Bear Vs Bull. 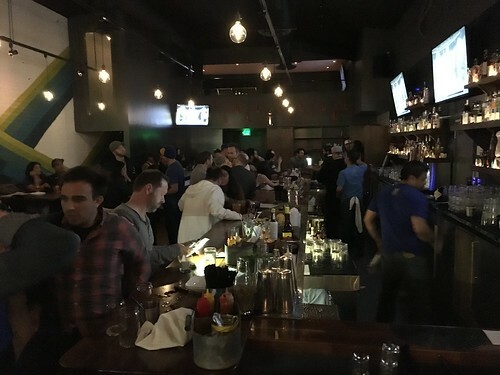 This time, though, they integrate the casual environment of a neighborhood dive with a spectrum of boozy treats: simple but carefully made cocktails, 30 beers (25 on tap), 18 boilermakers, and four frozen blended drinks. Spirits lovers will also rejoice in a wide selection of whisk(e)ys and agave bottles for decent prices. Does this mean that high prices and long waiting times are creeping into dive bars? Not here. Bottles and cans of beers are available for as little as $2 to $3, boilermakers go for as little as $7, and even pinky-up spirits drinkers will find the menu rife with deals (yes, Hibiki 12 for $12 and Pappy van Winkle bourbon for as low as $35 a pour. Please don't tell anyone else). 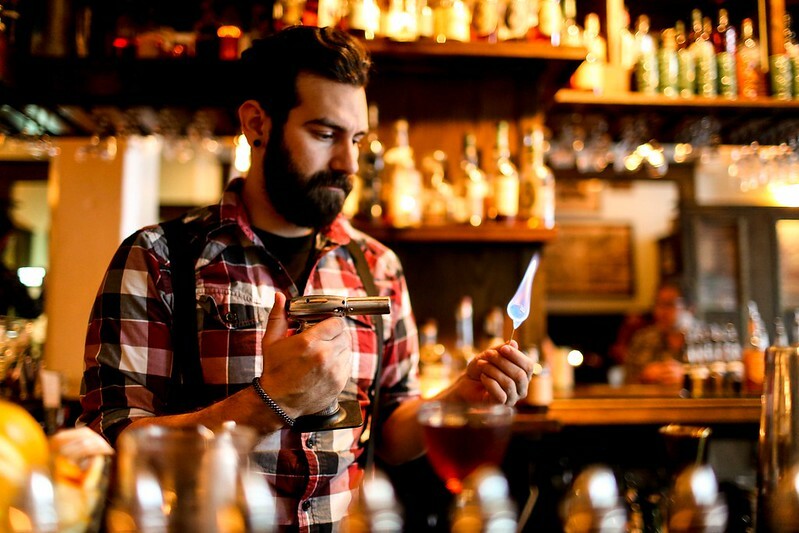 Leading the program is beverage director Isaac Shumway (formerly of Tosca, Heaven's Dog, Bourbon and Branch, French Laundry, and Gary Danko) who has built a reputation on his attention to detail. Many cocktail bars try to loudly flaunt precision and forethought, but Isaac is trying to do the opposite with Bear Vs Bull. He seeks to make the experience so familiar that guests may not even notice the extensive work behind the scenes. The space itself is wedged into a quiet corner of the Alamo Drafthouse, a chain known for comfy, text-and-talk-free movie theaters that allow you to eat and drink while you watch a flick. Crowds ebb and flow with the show times, as movie goers can casually lounge and discuss plot twists. 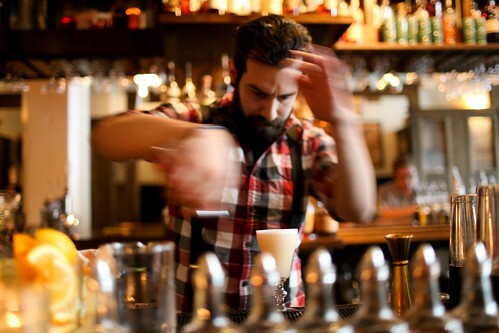 Between drinks, bartenders rotate a series of rock and roll records to keep the mood fresh. A smattering of tall tables and broad­ backed chairs allow guests to linger without feeling too cramped. 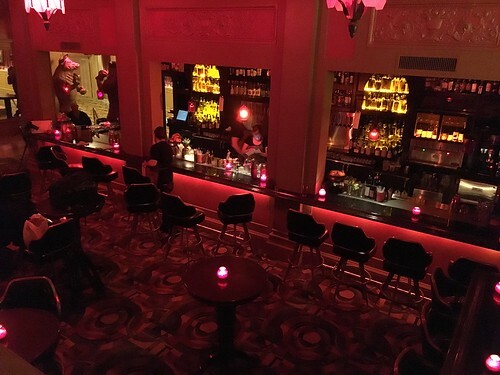 Behind the low key environment, Isaac and his team have sewn together a tightly knit theme that pays tribute to the theater's rich history, the neighborhood, and cocktail tradition. The theater that Alamo now occupies is over 100­ years ­old, its first heyday in the wild 1920s. At that time, cocktail forefather Charles H Baker was abroad in South America where he was chronicling a drinking culture that would turn into his book A South American Gentleman's Guide to Drinking. It just so happens that Bear Vs Bull is in the Mission District, a historically Latin community. 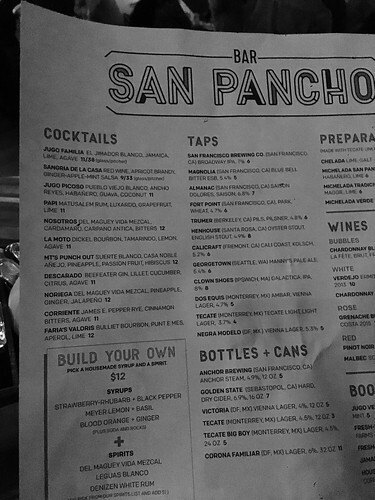 So Isaac decided to pay tribute to the Alamo Drafthouse's history and its neighborhood by featuring Baker's drinks from his South American travels in the 20s, an often overlooked chapter of the writer's famous history. In practice, this means honed Baker cocktails from his South American period. 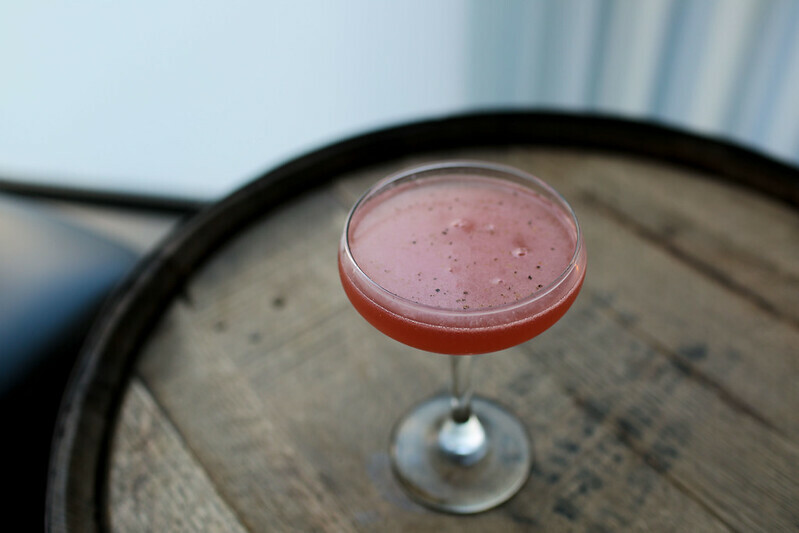 This rich and herbaceous cocktail will make fans of Old Fashioneds and Fernet giddy. 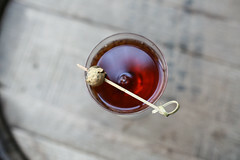 Christian Clark, formerly of Tosca, Big, and AQ, came up with the recipe for this cocktail, which Isaac says is the Remember the Maine variation that he himself has been unable to perfect for years. 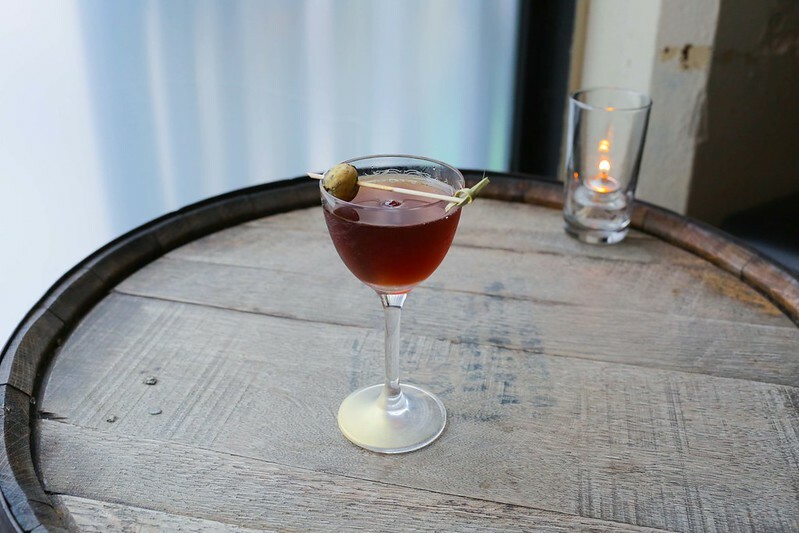 The original uses rye, sweet vermouth, cherry heering, and a bit of absinthe. Christian and Isaac tweak this cocktail by using Rittenhouse 100 (overproof rye), Latitude Adjustment, cherry brandy, house aromatic bitters, and orange peel. Do you ever ask a bartender how they like their own martini? This is Isaac's. Isaac creates a clean and fragrant version of this beloved classic by using Martin Miller's Westbourne Strength Gin. 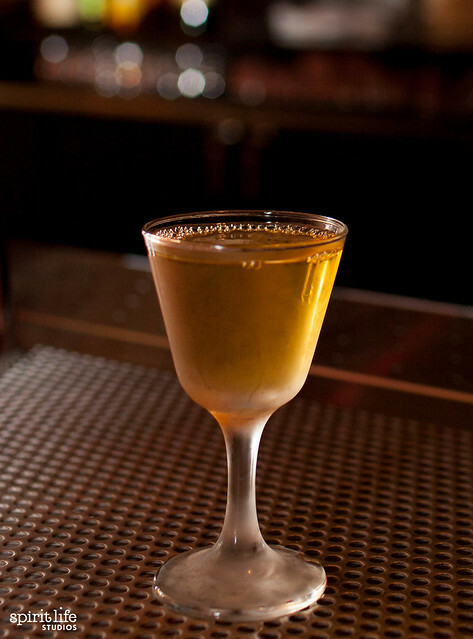 The ingredients sound strong, but the Waxman Special is an easy sipper, part juicy apple and part delicate bouquet. 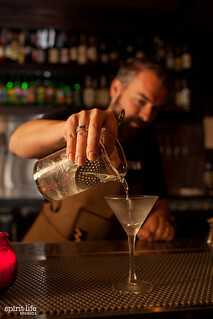 Isaac stirs together gin, specially made apple brandy from St George, French sweet vermouth, and yellow chartreuse. This refreshing cocktail sips a bit like a buttery Mint Julep. 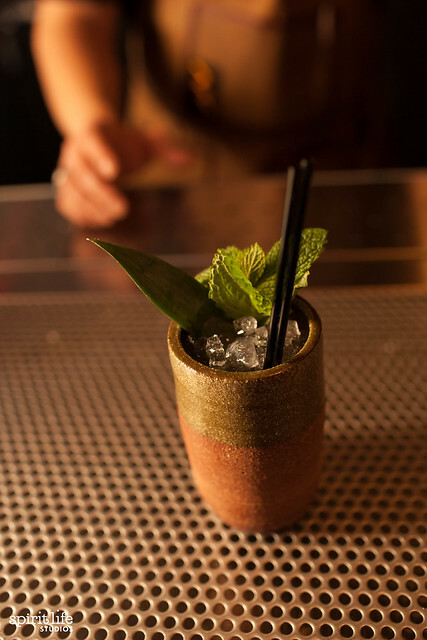 It combines calvados (French apple brandy), honey, coconut­-washed Cointreau (orange liqueur) and lime and is served in a custom­ made ceramic cup over cracked ice. Bear Vs Bull features a three­-drink selection of cocktails on tap, which allows the staff to move quickly but also play with new textures for the cocktails. 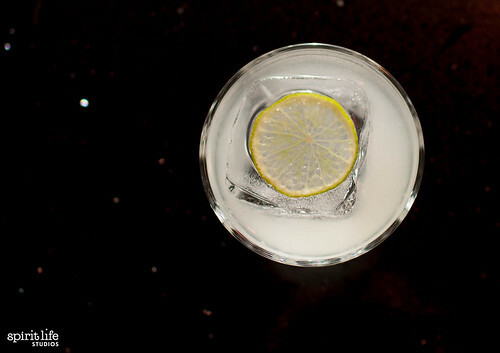 The original gimlet is made from gin and lime cordial, as beloved by drinkers as it is simple. 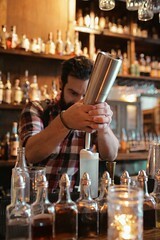 Isaac's version uses nitro to introduce tiny bubbles in the gimlet and serves it over a large, clear block of ice. The result is a creamy consistency. He also packs in a pleasant burst of citrus by making the lime cordial in house with fresh lime peels (did we mention he used to cook at The French Laundry?). For years, cocktails know­-it-­alls­, er, I mean cocktail geeks, have looked down on frozen or blended cocktails because of bad memories from high-­fructose blended drinks, headache free of charge. That and who doesn't love a high horse, amirite? Isaac, however, likes to point out that blended and frozen drinks are historical because you can find them in Charles H Baker's book (and we all know that to end cocktail argument among nerds, you simply need to establish some kind of historical precedent). Bear Vs Bull highlights four frozen and blended drinks to the menu. 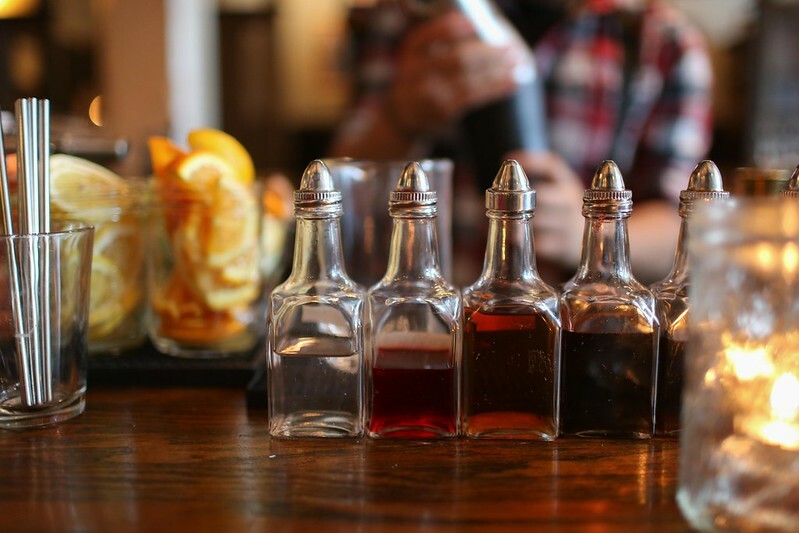 Each drink is carefully measured to spec and the amount of ice is weighed on a scale so that it has the perfect ice ­to­ drink ratio. While you can't get the frozen drinks in the theaters, you can order them at Bear Vs Bull and bring the frozen drinks into the movie with you. 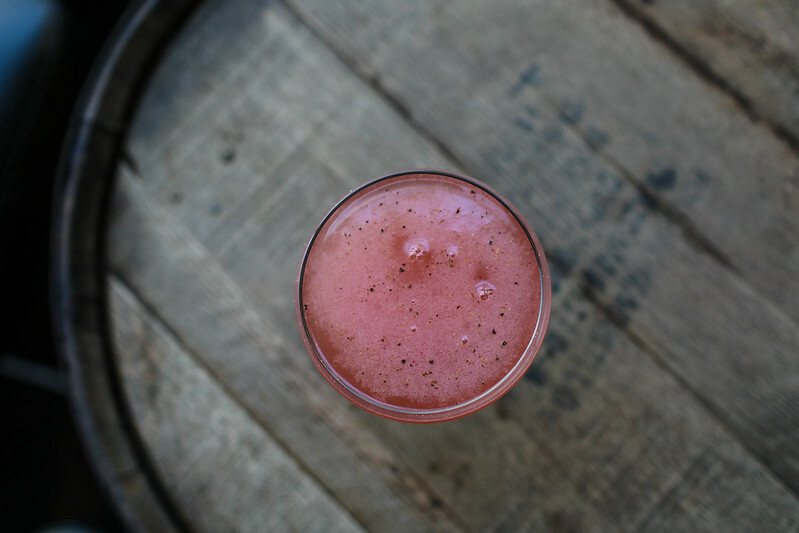 The Banana Cow is a pleasing frozen swirl of El Dorado 12­-year Guyana rum, a secret ingredient called "Cow syrup," grenadine, maraschino, lime, and half a banana. You can order cocktails, beers, and frozen drinks both at Bear Vs Bull and at the movie theater (see below for the full details, as there are some differences between the theater menu and Bear Vs Bull). 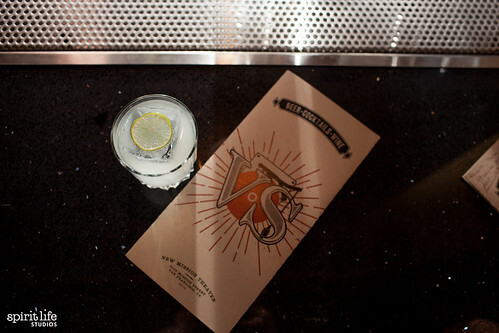 Theater drinks are served restaurant­ kitchen style with a full roster of bartenders at three wells that crank out drinks. 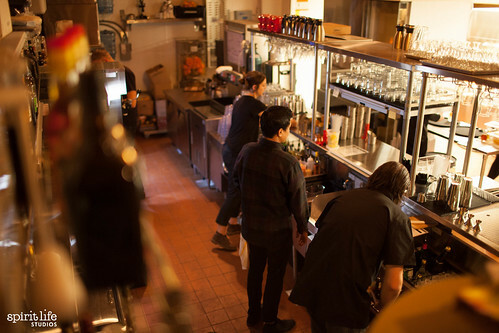 Bartenders first train in this kitchen before getting behind the bar at Bear Vs Bull. One easter egg you can only get in the theater (and not at Bear Vs Bull) is the adult milkshake. At $14 or so, these shakes are actually a steal because you're getting the best ingredients––Dandelion Chocolate and Strauss Cream, for example––and they're ridiculously rich, creamy, and smooth. Like most cocktail bartenders, Isaac and the Bear Vs Bull team love beer. And they particularly love it with shots. Their beer list, though massive, is carefully cultivated and the boilermakers are as thoughtfully paired as they are delicious. All Bear Vs. Bull beers are available in the theaters. You can take Bear Vs Bull cocktails into the theater, but you cannot order Bear Vs Bull cocktails in the theater. The theater has its own delicious cocktail menu, perhaps to be covered at a later date. You can order theater cocktails in Bear Vs. Bull (except the milkshakes).